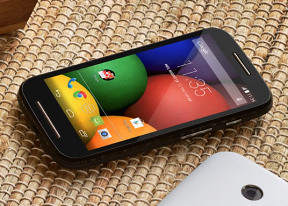 Motorola Moto E is running on the Snapdragon 200 budget chipset. It offers two Cortex-A7 CPU cores, Adreno 302 graphics and 1GB of RAM. This should provide about half the raw power the quad-core Moto G has under the hood, but hopefully the lower resolution will make up for the loss. Starting off with the CPU benchmarks, the Moto E posted an OK result on the multi-core GeekBench 3 cross-platform benchmark. While the score pales in comparison to the latest Krait processors, the Moto E matched the performance of the similarly powered Galaxy Core LTE and Ace 3. AnTuTu is a compound benchmark, which also takes into account RAM and GPU performance. The Moto E numbers are quite good, a whisker below than the quad-core Cortex-A7-powered Xperia C.
Basemark OS II is another all-round benchmark. It gives an overall score along with single, multi-core performance, math performance and more. We focus on the overall score and the dedicated CPU scores. The Moto E overall rating is quite poor, the singe-core performance is on par with other Cortex-A7-based chipsets, while the multi-core performance is, quite expectedly, twice as low as that by the quad-core Cortex-A7 phones. The graphics benchmark results turned out better than we expected. The GFXBench tests - both off-screen and on-screen variants - reflected a performance level, which is very close to the Moto G and HTC One mini 2 scores. The lower qHD screen resolution surely helped here as the Moto E has some 40% less pixels to draw than the Moto G.
Motorola Moto E and its Snapdragon 200 chipset offer good overall performance for its price and specs, even though its scores are quite uninspiring as numbers. What really matters is real-life usage - we certainly had a few cases where the Moto E froze or experienced some hiccups (the Camera app being the main culprit), we still feel the smartphone delivers a snappy performance for its price range. The Android KitKat OS is responsive, web browsing as quick as you would expect, popular games run fine and you can't ask for much more at this price point .